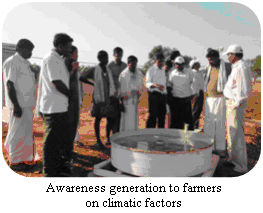 National Innovations on Climate Resilient Agriculture (NICRA) is a network project of the Indian Council of Agricultural Research (ICAR) launched in February, 2011. The project aims to enhance resilience of Indian agriculture to climate change and climate vulnerability through strategic research and technology demonstration. The research on adaptation and mitigation covers crops, livestock, fisheries and natural resource management. The project consists of four components viz. Strategic Research, Technology Demonstration, Capacity Building and Sponsored/Competitive Grants. The project was formally launched by the Hon’ble Union Minister for Agriculture & Food Processing Industries Shri Sharad Pawarji on 2nd February 2011. Climate change has become an important area of concern for India to ensure food and nutritional security for growing population. The impacts of climate change are global, but countries like India are more vulnerable in view of the high population depending on agriculture. In India, significant negative impacts have been implied with medium-term (2010-2039) climate change, predicted to reduce yields by 4.5 to 9 percent, depending on the magnitude and distribution of warming. Since agriculture makes up roughly 16 percent of India’s GDP, a 4.5 to 9% negative impact on production implies a cost of climate change to be roughly up to 1.5 percent of GDP per year. The Government of India has accorded high priority on research and development to cope with climate change in agriculture sector. The Prime Minister’s National Action Plan on climate change has identified Agriculture as one of the eight national missions. With this background, the ICAR has launched a major Project entitled, National Initiative on Climate Resilient Agriculture (NICRA) during 2010-11 with an outlay of Rs.350 crores for the XI Plan with the following objectives. Both short term and long terms outputs are expected from the project in terms of new and improved varieties of crops, livestock breeds, management practices that help in adaptation and mitigation and inputs for policy making to mainstream climate resilient agriculture in the developmental planning. The overall expected outcome is enhanced resilience of agricultural production to climate variability in vulnerable regions. The project is comprised of four components. Harnessing the beneficial effects of temperature in inland and marine fisheries through better understanding of the spawning behaviour. impact of temperature on flowering behaviour in mango. A nationwide pest surveillance and monitoring system has been put in place for all the target crops for major pests and diseases wherein real time incidence is being monitored along with weather parameters to build pest warning models. Methods for measurement of green house gas emissions in the marine ecosystem have been standardized. Carbon sequestration potential through agro forestry systems across the country is being quantified. Monitoring of experiments on conservation agriculture in different production systems is initiated to assess the adaptation and mitigation potential of CA practices. The vulnerability of all the rural districts in the country (about 540) is being quantified in terms of exposure, sensitivity and adaptive capacity in order to prepare a vulnerability atlas. The technology demonstration component deals with demonstrating proven technologies for adaptation of crop and livestock production systems to climate variability. 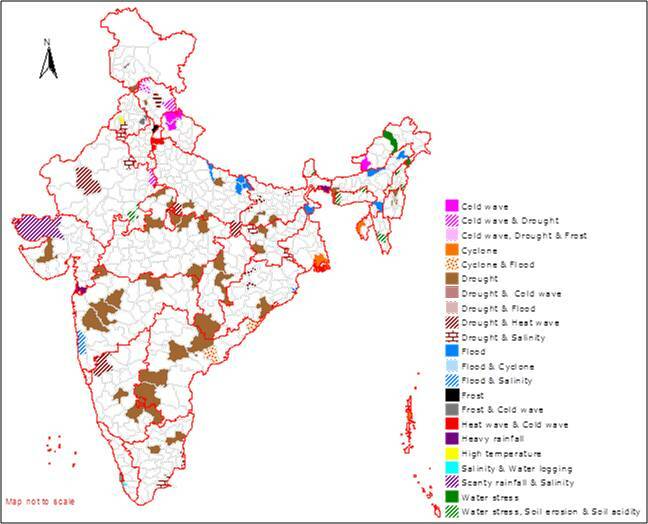 Cyclone proneness based on frequency as recorded by IMD/State Disaster Management agencies. Flood proneness based on IMD data and NDMA maps. Vulnerability to heat wave and cold wave based on IMD grid data on temperatures. Module I: Natural resources: This module consists of interventions related to in-situ moisture conservation, water harvesting, supplemental irrigation, improved drainage in flood prone areas, conservation tillage where appropriate, artificial ground water recharge and water saving irrigation methods. Module II: Crop Production: This module consists of introducing drought/temperature/flood tolerant varieties, advancement of planting dates of rabi crops in areas with terminal heat stress, water saving paddy cultivation methods (SRI, aerobic, direct seeding), frost management in horticulture through trash burning, community nurseries for delayed monsoon, custom hiring centres for timely planting, location specific intercropping systems with high sustainable yield index. Module III: Livestock and Fisheries: Use of community lands for fodder production during droughts/floods, improved fodder/feed storage methods, preventive vaccination, improved shelters for reducing heat stress in livestock , management of fish ponds/tanks during water scarcity and excess water, etc. Module IV: Institutional Interventions: This module consist of institutional interventions either by strengthening the existing ones or initiating new ones relating to seed bank, fodder bank, commodity groups, custom hiring centre, collective marketing, introduction of weather index based insurance and climate literacy through a village level weather station. 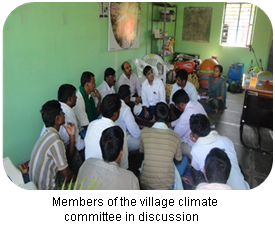 The unique features of this project are setting up of custom hiring centers in all the 100 villages and formation of Village Climate Risk Management Committees. For each intervention, it is planned to work out the carbon, water and energy foot prints. Early Outcome The project has made significant initial impact and was well received in most of the districts. 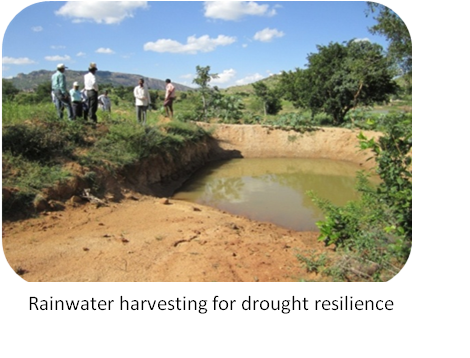 Technologies such as on-farm water harvesting in ponds, supplemental irrigation, introduction of early maturing drought tolerant varieties, paddy varieties tolerant to sub-mergence in flood prone districts, improved drainage in water logged areas, recharging techniques for tube wells, site specific nutrient management and management of sodic soils, mulching, use of zero till drills were enthusiastically implemented by the farmers in NICRA villages across the country. In Belgaum district village level agro-advisory system was piloted successfully. The intervention which found tremendous support across the country was the custom hiring centres. One hundred such centres are opened across the country and this intervention posed several research problems which were not anticipated like lack of tractors in some tribal villages and the difficulty in using tractor drawn implements. In the first year itself, between Rs. 5000 to 50,000 revenue has been generated in many villages and the VCRMCs as an Institutional mechanism is able to manage these centres. Overall, the project has generated high enthusiasm among farmers and raised hopes that by combining technology solutions with community mobilization, we can help small and marginal farmers to cope with current climate variability, to some extent. Under this component, critical researchable issues like impact on plant pollinators, fisheries in esturian habitats, hail storm management, hill and mountain eco-system, small ruminants and socio economic aspects of climate change etc. are provided research grants. Since climate change is an emerging area of science, capacity building of young scientists on simulation modeling, high through put phenotyping, greenhouse gasses measurement, etc. is being taken up through training programs organized in India and sponsoring scientists abroad. Simultaneously, more than 100 training programs have been organized across the country covering 50000 farmers to create awareness on climate change and variability. State of the art infrastructure is being built at the major research institutes of the ICAR to take up long term basic and strategic research on the impact of climate change on crops and livestock, modeling future climate impacts on agriculture, water resources and development of location specific adaptation and mitigation options. To address critical gaps in the initiative, specific additional projects have been sanctioned within the scheme under sponsored/competitive mode from institutions within and outside NARS. These projects are addressing critical areas like arid zone, hill and mountain eco system, climate impact on pollinators, hail-storm management and socio-economic impacts of climate change including adaptation financing. In the limited time of one year, efforts are being made to build state of the art of infrastructure, set up the best equipments for basic research, initiate large scale screening of crop/horticulture germplasm for heat, drought and flooding stresses, characterize livestock breeds in relation to climatic stresses and study the impact of climate variability on spawing in marine and freshwater fisheries. Considering that the climate variability impact the food production in future it is important that we continue to address this critical area in XII Five Year Plan with significant emphasis. Hence, the scheme is being formulated to build up on the initiative taken during XI Five Year Plan, by strengthening the theme areas, viz., phenotyping/breeding programs in crops, horticulture and livestock, simulation modeling to understand the impacts at regional level and national level, address crops and regions which could not be covered in the XI Plan and expand the technology demonstration to more vulnerable districts. Setting up of high through put phenotyping platforms and temperature, CO2, ozone gradient facilities at identified locations/ institutions including North East region. Expanding the technology demonstration and dissemination to 130 vulnerable districts of the country. Expert Committee Reviewed ongoing Projects under NICRA during 6-7 February, 2019. DG, ICAR Inaugurates NICRA Research Facilities at ICAR-IIHR, Bengaluru on 6 February, 2019. NICRA Zonal Monitoring Committee reviews KVKs at Bharatpur, Jhunjhunu and Kota on 4th February, 2019.